How about them playoffs so far? Nothing quite beats the excitement of the NHL playoffs! There have been a lot of close games, highlight reel goals and amazing saves. Let’s take a look at the Western Conference teams who have advanced to the 2nd round. Patrick Sharp has been dominant so far this postseason. They just needed five games to eliminate the Minnesota Wild. Patrick Sharp had an astounding 5 goals in the series while Marian Hossa (3g-3a), Patrick Kane (5a) and Duncan Keith (1g-4a) have rounded out the scoring. In fact, 15 players have at least one point. Chicago’s goaltending has been phenominal with Corey Crawford posting a 1.32 G.A.A and .950 save percentage. 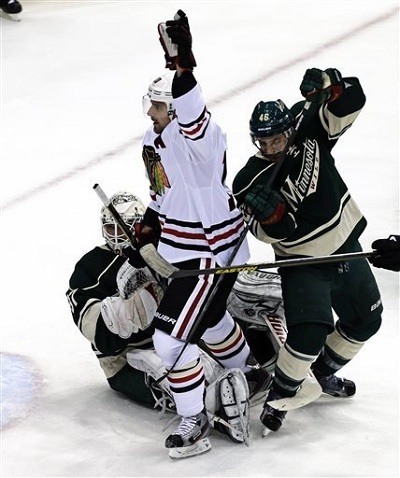 Perhaps the most intriguing stat was the fact that the Blackhawks killed 100% of the Wild power-play opportunities. This team looks like the favorite to come out of the Western Conference. Joe Pavelski and Patrick Mareau have been key in San Jose’s success. Swept the Vancouver Canucks. Logan Couture, Joe Pavelski, Joe Thornton and Patrick Marleau combined for 27 points in the sweep. Like the Blackhawks, they also were strong between the pipes. Antti Niemi had a 1.86 G.A.A and a .937 save percentage. San Jose was strong on the power-play, converting 7-24 chances (29.2%). Jeff Carter has 3 goals this postsesaon. The Kings beat the St. Louis Blues in 6 games. They are heavily relying on their goaltender Jonathan Quick. The Kings scored 12 goals, which was the lowest amount of any team to advance to the 2nd round. 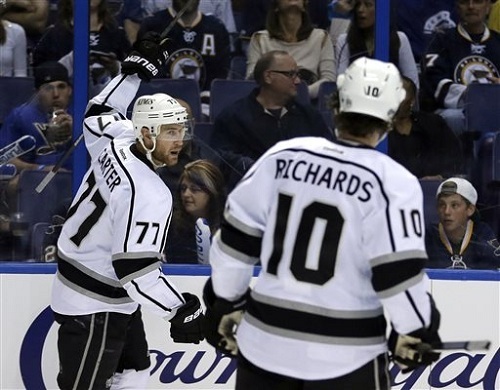 4 players (Justin Williams, Jeff Carter, Dustin Penner, and Slava Voynov) accounted for 9 of those goals. If they are not scoring, no one else really is. Quick only allowed 10 goals in the opening round with one shutout. Pavel Datsyuk looks to lead his team to victory. At press time, this series was knotted up at 3-3. Who is going to win this game? That’s a tough call. The Ducks have 13 players who have 2 or more points. Ryan Getzlaf (3g), and Bobby Ryan (2g) have been providing scoring for the team. Jonas Hiller has been tested a lot and is evidenced by his 2.37 G. A.A. They have scored 19 goals in 6 games, 3rd best amongst teams so far this playoffs. Detroit just won’t go away. Just when you think they are done, they keep fighting. Pavel Datsyuk (2g-5a) and Henrik Zetterberg (2g-4a) lead the team in points. Detroit has been pretty successful on the power-play (26.1%). More importantly, the Wings have won 3 games in overtime. If game 7 goes to OT, I’m putting my money Detroit will win.